I just purchased an Siberian Husky puppy and was researching possible trainers with the city of Victoria, BC. I came across the Wonderdogs website and immediately contacted Ben to discuss the possibility of his staff training both my new puppy. Ben informed me that Jillian would be my puppies trainer. I registered for 12 training sessions and saw amazing results within the first couple of sessions, Jillian is such an incredible trainer, she has great instincts and knows exactly what the dog is thinking. During the 12 training sessions Jillian taught both my puppy and myself. I was so impressed that I signed up for another set of sessions. Having Jillian and Wonderdogs working with my puppy (Fenway) has only enhanced the relationship that one will have with their pet. Jillian, I am so happy that you were the one training my Fenway. We want to thank you for having Jill help us with re-training Whiskey. The lessons have proven to be invaluable. We now have a “dog”. We know that it will take continued work and consistency to keep Whiskey on the right track. I can’t tell you how happy we are to be able to walk Whiskey and have him see other dogs without going beserk barking. We know it’s a long road that will continually need to be re-inforced, but we are confident now that we have the tools. Also, I must say that Tony had mentioned that he was very comfortable with you as a trainer and he felt good about the way you were “training” him…hahahha. Ben, I can’t say enough about the success we have had. I have taken video of the difference and will be sure to show it to everybody who has issues with their dogs and I will sing you praises…..thank you again. Just wanted to pass a quick note on how our twelve training sessions went with Rob Moore. 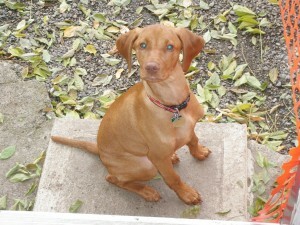 My Vizsla Juno started with Rob in early December. We initially set some goals that one would expect for a four month old puppy. My expectations were the following….continue with the basic commands, sit, stay, come, down and the big one working around other dogs while still obeying commands. I have broken down what Rob and I completed in the twelve sessions below…. Sit, down, hold and come commands completed. The hold command was accomplished with other dog distractions, toy distraction, and food distraction. The hold command, we where able to go out of sight and to a large distance away from Juno with her sitting the entire time. The come command was done with both voice and hand signal. Again Juno responded well with other dog distraction, toy distraction, food distraction and background road noise. Juno has responded well to walks without pulling on the lead and I’ve started recently riding my mountain bike with Juno. She has also completely trained on our treadmill at home for those days it is too nasty outside. I have no fear having off leash as I know she will come when called. I also know Juno will hold until she hears the big OK!! Rob also spent some time at the end on the training sessions with my wife to ensure consistency was maintained. Again Juno responded well. Overall our experience with Rob was fantastic! I would highly recommend him to anyone. Rob was on time and communicated very well with text, e-mail and coaching. We surpassed the goals I wanted to see with Juno for her age as a pup. I am a very proud dog owner! Juno is continuing to respond well to all commands and I look forward continuing with some additional training when she get’s out of the puppy stage. Juno is truly a wonder dog! I have included a picture of Juno holding for the release command………..